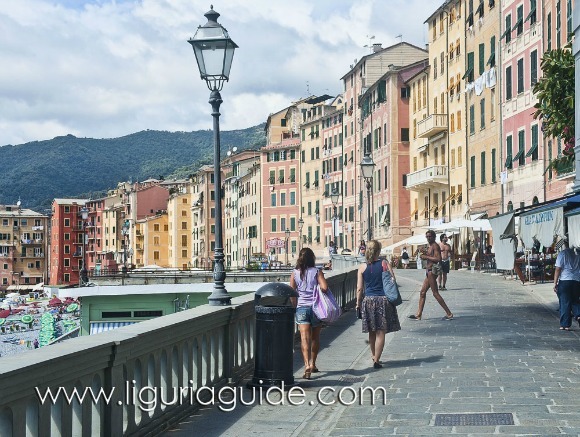 If there is one thing you have to do on your visit to Camogli that is to take a stroll along its characteristic seafront promenade. 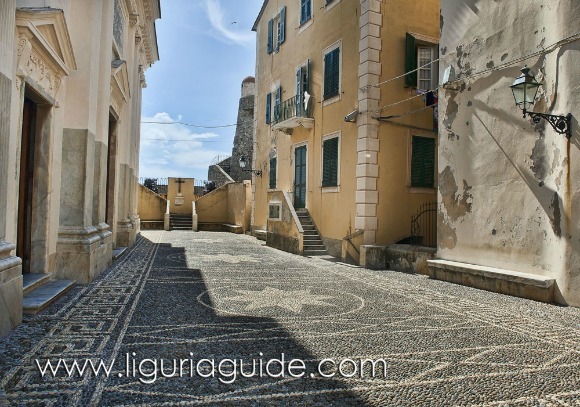 Weave your way through the charming rows of tower-houses in town, and head down towards the direction of the sea. 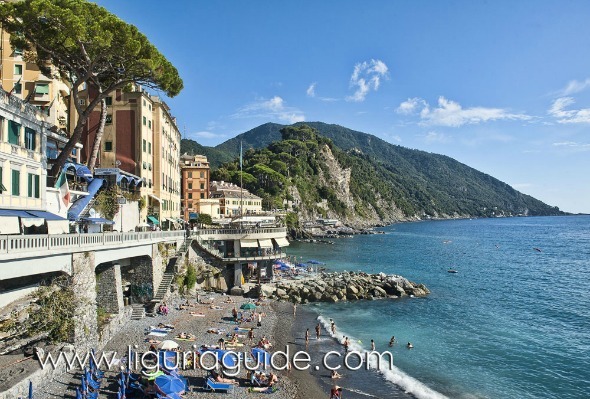 The promenade has been framing the central beach in Camogli since the beginning of the last century and once you step on it, you are faced with a spectacular view. 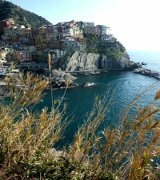 On one side, your eyes will feast on a range of orange and yellow hues from the magnificent tower-houses basked in warm sunlight which are perfectly contrasted on the other side by the open views over the stunning blue sea and the bustle of the beach. 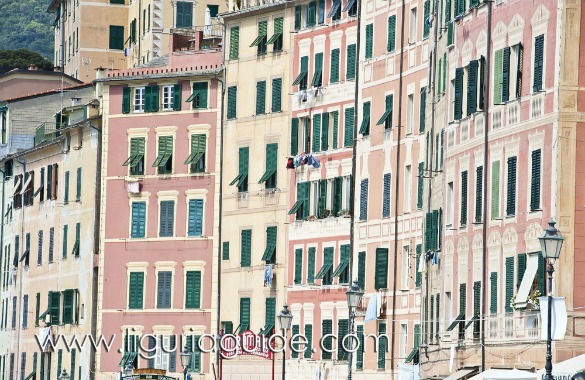 Looking for a place to stay on your Camogli Tour? 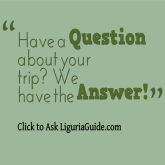 Check our Hotel Recommendations and Book NOW ! While in the past the area here was full of warehouses with fishing equipment and fish-boat workshops, the new seafront promenade is today the centre of the town’s tourist life. Here you will find tons of bars and restaurants as well as souvenir, craft shops and art galleries. 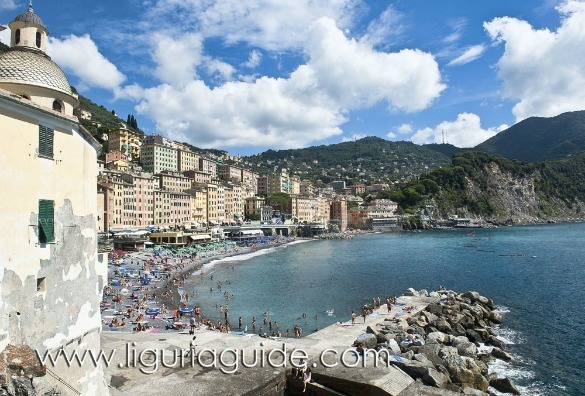 The promenade naturally leads you towards the Basilica of Santa Maria Assunta which is perched on the rocks at the west end of the beach. 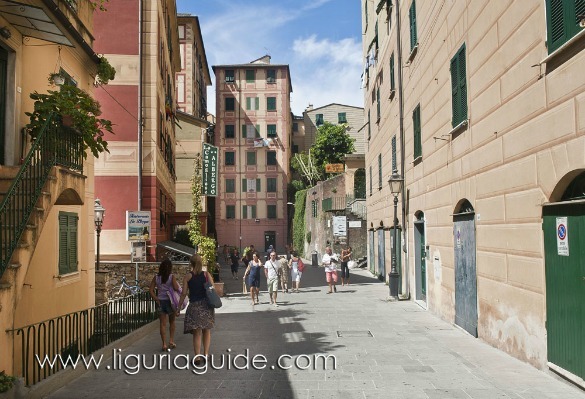 Before heading towards its entrance, make sure you take a moment to walk along the rock pier alongside it as it is a great spot to really appreciate the beauty of Camogli magnificent tower-houses. 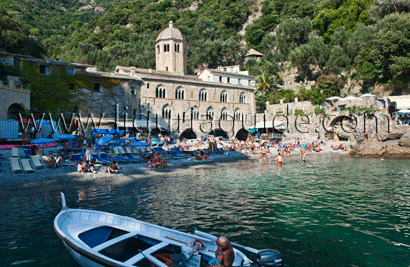 The Basilica of Santa Maria Assunta sits on a rock overlooking the sea on a small peninsula. It was built in the early 12th century as a chapel of the nearby Dragonara Castle. 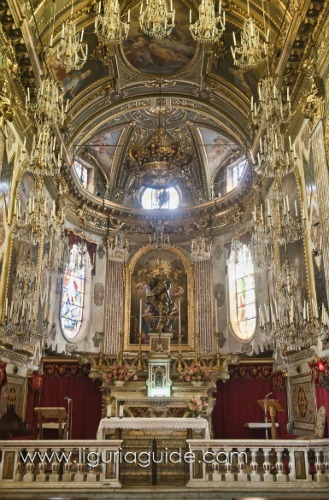 The Church was later extended and has undergone numerous transformations during the centuries. The present building dates back to the end of 16th century with some 19th century modifications made to the building. 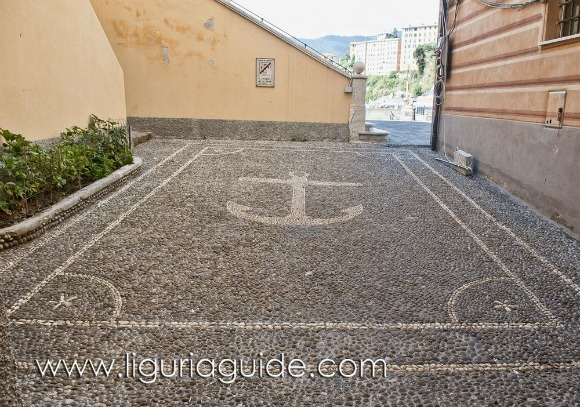 The outside courtyards of the church are quite interesting – they are laid out in a typical Ligurian style using smoothed pebbles of different colours to form patterns and different themes. 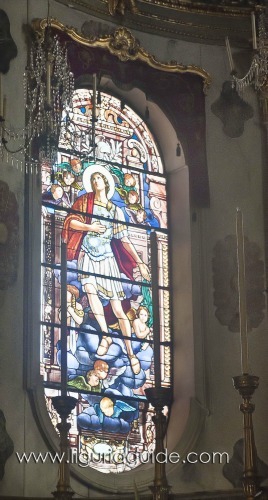 The inside of the church is decorated in baroque style overflowing with gilded stuccoes and marbles, complemented by magnificent chandeliers. 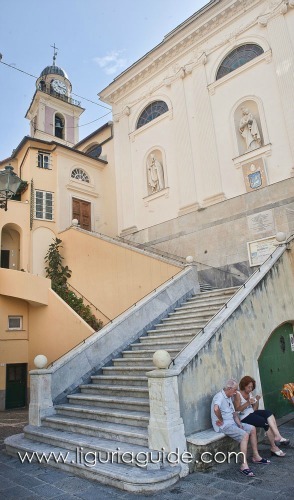 The church houses the sacred remains of the two patrons saints of Camogli - San Fortunato, patron saint of fishermen and sailors; and San Prospero, the patron saint of the city. 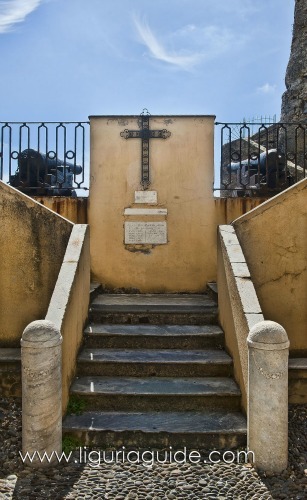 Cristo in Croce con I santi Prospero e Caterina d’Alessandria – a cross by Bernardo Castello which dates back to 1599 and has been used in town processions. Sant’Antonio e I bambini – a sculpture group by Guido Galletti who sculpted the Cristo degli Abissi statue at San Fruttuoso. Turning left from the Basilica' courtyard, takes you to a set of steps leading to the terrace at the bottom of the Dragonara Castle. There some lovely views to enjoy here over the Gulf as well as a perfect spot to take in the stone structure of the Castle. The Dragonara Castle is said to date back to around 1130 and sits on top of a small rocky peninsula, overlooking the Gulf of Paradiso. 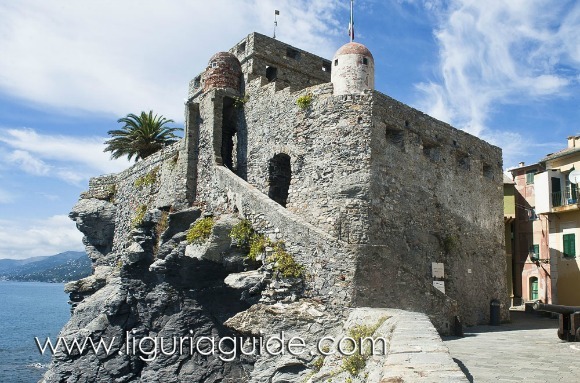 According to the legend the name of the Castle derives from the name of the savage Ottoman pirate, Torghud, known in Liguria as Dragut. 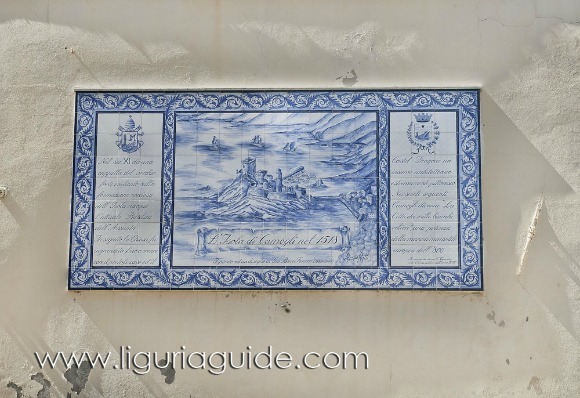 During the centuries the Castle has played various important roles: at the beginning it was conceived as a defensive fortress guarding the safety of the town from pirate attacks coming from the Mediterranean sea. In the 16th century, it was used as a prison, while in the 19th century it became the premises for town meetings. In 1971, it hosted the ancient Acquario Tirrenico which exhibited different specimens of marine fauna and remained open for some years. The castle is thus considered the forerunner of the Aquarium of Genoa. 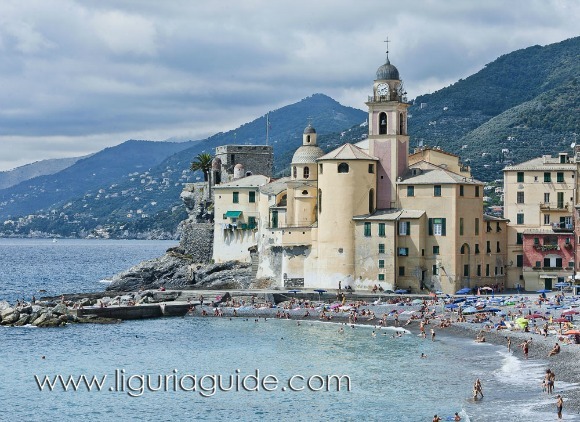 Nowadays, the Castle houses a permanent multimedia exhibition called “Un port@le sul mare” dedicated to the history of Camogli and its ties to the sea. 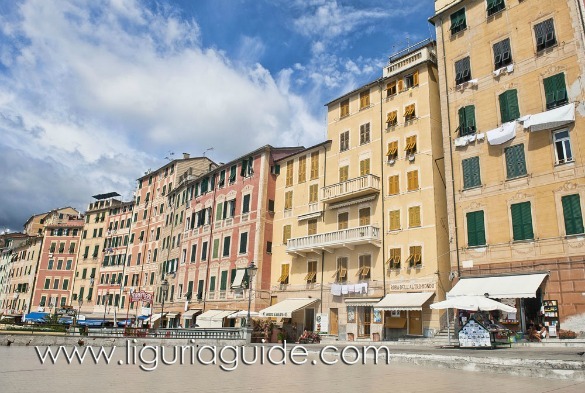 Camogli’s Maritime Museum - Museo Marinaro - is dedicated to Gio Bono Ferrari who set it up in 1937. Though native to Camogli , Ferrari had spent a long spell in Argentina and upon his return he dedicated himself to researching the seafaring traditions of his town which he later exhibited in the Museum. The Charter of the Mutua Assicurazione Marittima Camogliese ( Camogli Maritime Mutual Insurance) founded in 1853 and used as the model by other insurance companies. 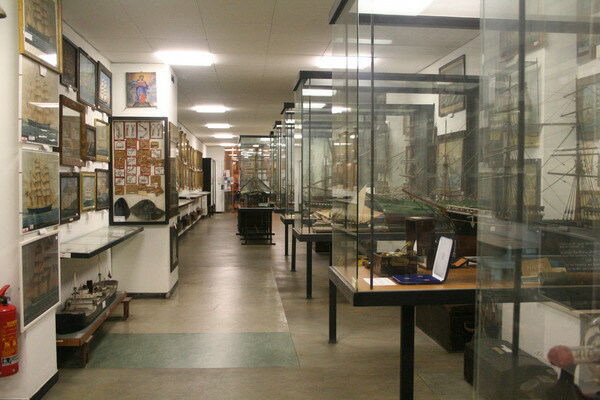 Models and paintings of various ships and sailing vessels. 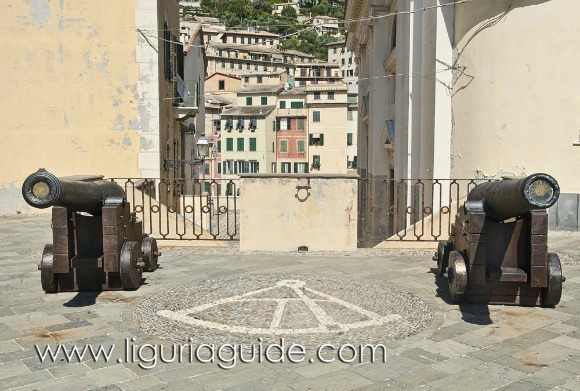 The “Tonarella” of Camogli is an ancient fishing trap system dating back to 1603 and used for catching tuna and other fish. 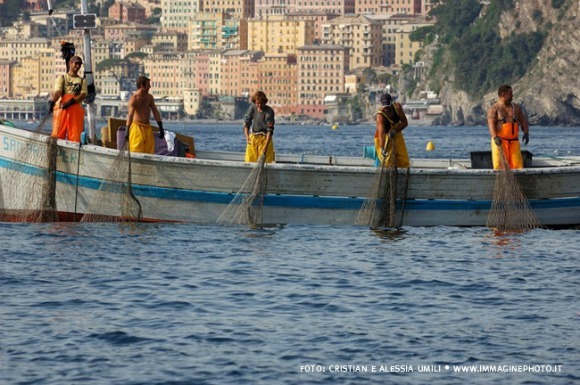 It works by dropping fixed nets extending 340 meters in the waters below San Rocco and west of Punta Chiappa between the months of April to September. The nets are made of coconut fibre that comes from India and at the end of the season they are dropped to the bottom of the sea and used as fish food. So if you are visiting the area between April 14th and August 31th, you can enjoy an organised excursion at sea to visit the Tonnarella. 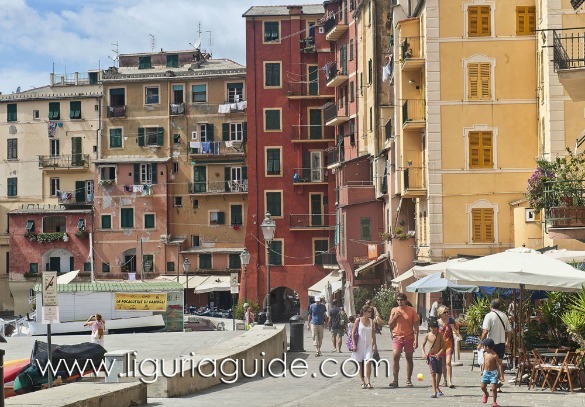 The boat tour takes about 2 hours and departs from ferry terminal in Camogli on Saturdays and Sundays. 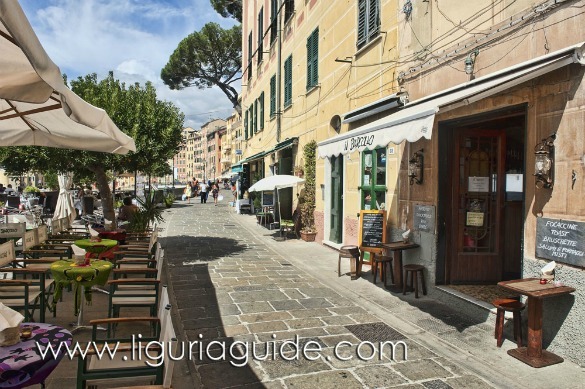 It also includes a visit to the Fishing museum at Punta Chiappa which was created by the Cooperative Pescatori di Camogli and is housed in a small warehouse once used to store fishermen equipment.